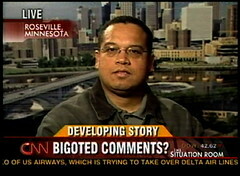 As a follow-up to TChris' post here, Wolf Blitzer had newly elected Congressman Keith Ellison on the Situation Room this afternoon. In a letter released to CNN Wednesday, Goode wrote in part to a constituent, "I do not subscribe to using the Koran in any way. The Muslim representative from Minnesota was elected by the voters of that district and if American citizens don't wake up and adopt the Virgil Goode position on immigration there will likely be many more Muslims elected to office and demanding the use of the Koran." Ellison's response: Goode "has a lot to learn about Islam." "I would urge Congressman Goode to have his congregation reach out to a synagogue or a mosque and start some inter-faith dialogue so we can increase understanding among each other as American of different faiths," Ellison said.